Raised on a turkey farm in central Minnesota, his parents were of Swedish ancestry and followed a fundamentalist evangelical faith. “In the 5th grade I realized there was something different about me, I was gay, but I didn’t really know what it meant. I never talked to anybody about it,” he recalls. Holmgren endured the regular chemical exposure for six months. During this time he also injured his ankle, it was a routine hairline fracture. But nothing ended up being routine for Holmgren. While still in Saudi Arabia he began having problems with vertigo. He finished his stint oversees and returned to the base in California. He was soon diagnosed with labyrinthitis, severe swelling of the inner ear. Chemical exposure is a known cause. A few years later a rare giant cell tumor was found where the fracture had been in his foot. It was a benign tumor that devoured bone. “I spent 32 nights in the VA Hospital, and they removed the cyst and filled up that empty space in my ankle with bone cement,” he remembers. It would be the first of many surgeries on his foot. The severe vertigo would also dog him. In an attempt to fix it, doctors performed surgery on his brain. It was unsuccessful and left him with hearing damage. He completed his military service in 1995 and moved away from his evangelical friends. He became isolated and deeply depressed. He made plans to kill himself. Then, by chance, he connected with a former high school teacher who convinced him to seek help. He was admitted to the psychiatric ward at Abbott Northwestern Hospital. He was released from Abbott after eight nights and continued treatment in an outpatient therapy group. He began to admit the truth about his sexual orientation. He moved to the Twin Cities and eventually joined the Gay Men’s Chorus. In the chorus he discovered “an amazing family in a safe community of very kind people.” He met other GLBT vets through a veterans program called Homeward Bound at the Minneapolis Community and Technical College. His mother and his brother, who is also gay, came to care for him during the surgery. His parents have softened over the years. “Being Swedish, we don’t talk about everything, but there is a lot of love,” Holmgren says. However happy he may be with the local VA, Holmgren questions the motives of both of the wars in Iraq and Afghanistan. 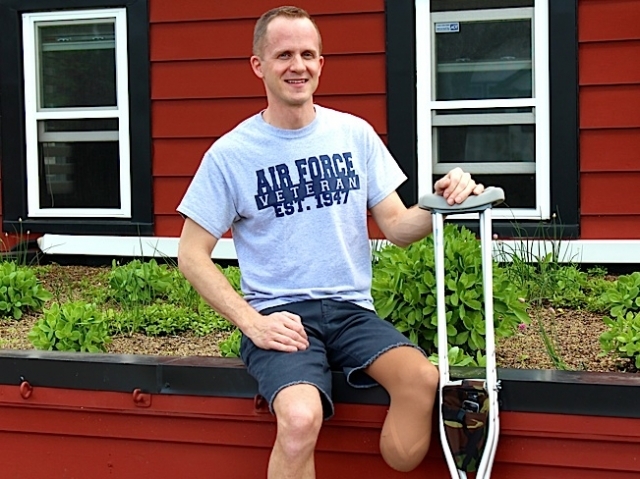 “It saddens me to see so many new veterans in need of prosthetics. I’m realizing now that life is just so short. I need to do what I can to support my peers and to be happy myself. I was helped by so many people, it’s time for me to give back,” muses Holmgren. Holmgren invites military veterans to reach him at this email address 1704PRS@gmail.com.